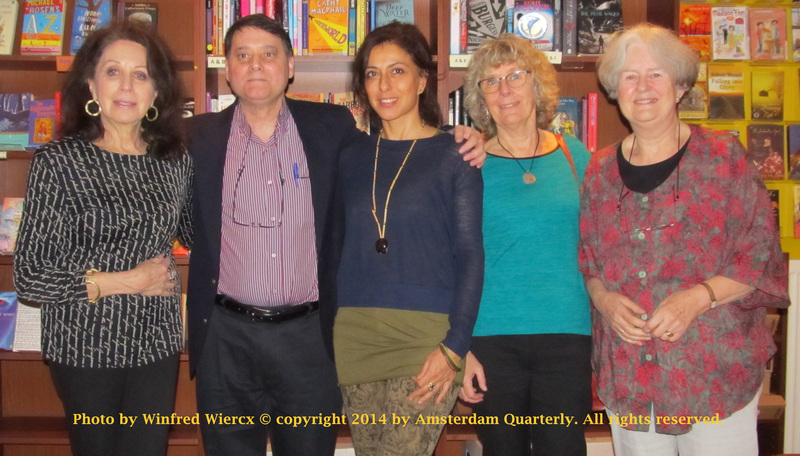 Sunday, 23 November, 2014, Amsterdam Quarterly held its fourth, annual yearbook launch party and reading for an enthusiastic and appreciative audience at The English Bookshop. To celebrate the publication of the Amsterdam Quarterly 2014 Yearbook, five AQ contributors read fiction, memoir and poetry. The AQ 2014 Yearbook includes work by well-known authors such as exclusive interviews with BBC/NPR humourist David Sedaris(AQ9) and 2009 T.S. Eliot Poetry Award winner, Philip Gross (AQ10), a memoir by Neil Hughes of riding the historic North Yorkshire Moors Railway (AQ9) and feature article on how Stephen King writes (AQ11). Readers for the book launch included—from Paris—six-time AQ contributor, former CBS Evening News correspondent and present The Huffington Post contributor, Joan Z. Shore—and from Amsterdam and the Netherlands—poets and memoirists Patricia Seman and Iclal Ackay, poet Sarah Kinebanian and AQ’s publisher and editor, Bryan R. Monte. 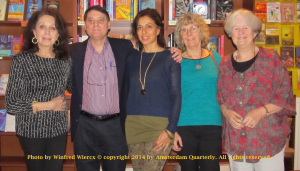 On 17 January 2015, visual artist Yolanda V. Fundora (AQ 10 & 11), poet and fiction writer Irving Greenfield (AQ 9), fiction writer Arthur Davis (AQ11)and AQ publisher/editor and poet Bryan R. Monte will read their work at the Anne Frank Center at 44 Park Place in New York City from 2 to 4 PM. Admission to the reading is free, but seating is limited so reservations must be made with AQ’s editor and confirmed by him. RSVP at editor@amsterdamquarterly.org. AQ was founded in 2011. Its goal is to publish, promote and comment on writing in Amsterdam, the Netherlands and the world. The AQ 2014 Yearbook includes work in 10 different genres: art, articles, drama, essays, fiction, interviews, memoirs photography, poetry and reviews. AQ will be reading submissions for its spring 2015 issue this January. The theme of that issue, AQ 12, will be writers on writing and other writers and will feature a memoir of the late University of California poet and writer, Thom Gunn by Bryan R. Monte.